When Tai Shan and his father, Baba, fly kites from their roof and look down at the crowded city streets below, they feel free, like the kites. 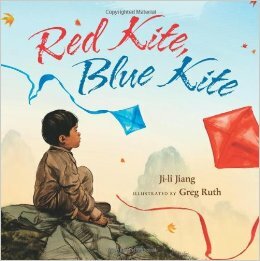 Baba loves telling Tai Shan stories while the kites--one red, and one blue--rise, dip, and soar together. Then, a bad time comes. People wearing red armbands shut down the schools, smash store signs, and search houses. Baba is sent away, and Tai Shan goes to live with Granny Wang. Though father and son are far apart, they have a secret way of staying close. Every day they greet each other by flying their kites-one red, and one blue-until Baba can be free again, like the kites. 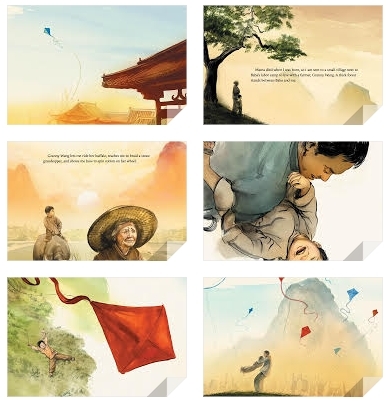 Tai Shan and Baba's story, desperately sad (though it ends happily), is tempered by the child's sweet narrative voice, and by the luminous, dreamy landscapes rendered in Ruth's ink-and-watercolor illustrations. Ruth conveys the majestic, poetic vistas of a bygone rural and small-city China as well as the intimate configurations of Tai Shan, Baba and Granny Wang. Readers will welcome the delicious reunion at the end, while empathizing with—though not overly suffering through—Tai Shan's story during its melancholic passages.